The son of a multi-millionaire Greek businessman has crashed his speeding Porsche into a parked car causing both vehicles to erupt in flames. The driver and three others were tragically killed in the crash, including a mother and her three-year-old child. George Vakakis, 24, barreled his rented Porsche into a Honda Civic which was legally parked at a rest area on the Athens-Lamia National Highway on Sunday, according to the LamiaReport. The Civic, which was carrying a 33-year-old mother and her son, 3. Both vehicles burst into flames upon impact. “It’s horrific. The family was waiting in the parking. They weren’t even on the emergency lane,” a driver passing through told LamiaReport. The father of the young boy, who was inside the rest area at the time of the crash, ran out of the building when he heard the crash. 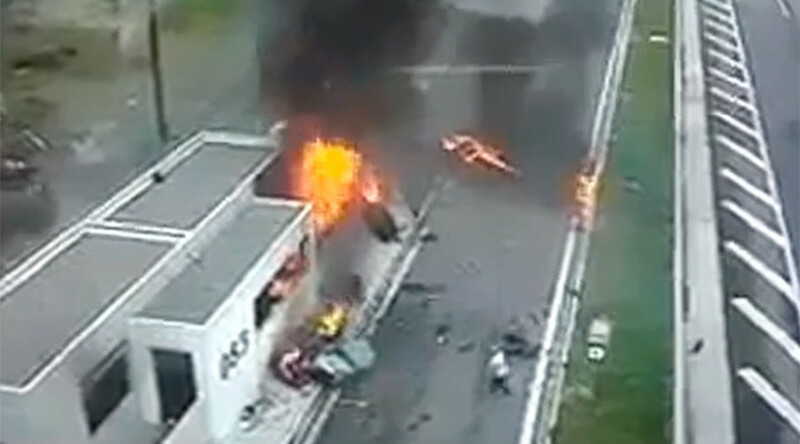 Heartbreaking footage posted online shows the man staring helplessly at the crash site. Vakakis,24, was also killed in the crash, along with 24-year-old passenger Andreas Georgakopoulos, who was not wearing a seatbelt and was ejected through the window. The driver was the son of Apostolos Vakakis, the owner of toy retailer Jumbo. The company is Greece's largest enterprise, operating dozens of stores throughout the country. It also has a presence in Bulgaria, Serbia, Romania, Cyprus, Kosovo, Albania, and Macedonia.